Team Chandigarh Management Association (CMA) won AIMA’s Best LMA Award for yet another consecutive year. 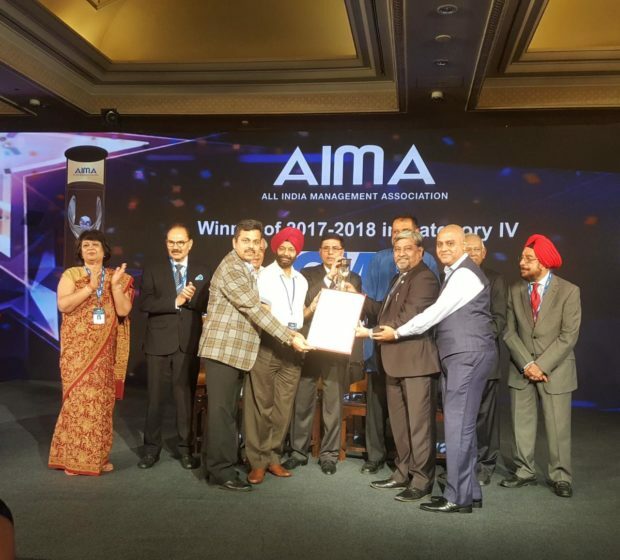 This award for the year 2017-18 was announced by the All India Management Association (AIMA) at their 45th National Management Convention held on September 26th & 27th at Hotel Taj Palace, New Delhi. Mr. Deepak Dhingra, President CMA and Mr. Hitesh Kumar Gulati, Secretary General for the year 2017-18 received the award along with members of the executive committee. The AIMA Best LMA (Local Management Association) Award Jury, chaired by Mr. D. Shivakumar, Past President, AIMA & Group Executive President (Corp. Strategy & Business Development), Aditya Birla Management Corporation Pvt. Ltd., unanimously ranked CMA to be the best LMA in Category IV. This award was presented to CMA for its innovative initiatives and hosting a number of uniquely insightful events throughout the year in various domains of management including a global symposium at the UAE.